Changing the strings on an Epiphone or other guitar brand gets easier with experience, but every guitar player should learn to do it correctly from the start. Whether you have an Epiphone steel-string acoustic guitar or an electric guitar, changing a string is the same except for a slight variation with "bridge pin" type of acoustic bridge. Restringing is part of your guitar's overall care and maintenance plan, and it also is a time to inspect and clean your Epiphone to keep it looking and playing its best. Spread a towel or blanket on a flat surface, and lay the guitar down with the strings facing the ceiling. Loosen the thickest string (the sixth, or "E) by inserting the peg winder onto the corresponding tuning key and turning the key clockwise. When the string is loosened, remove it from the string post by unwrapping the windings and pulling the string through. Push the string out through the bridge to remove it. If you are changing strings on an acoustic Epiphone that uses bridge pins, prying them out with the notch in the peg winder will free the string. Insert the plain end of the string into the bridge, and pull the string through. If the guitar has bridge pins, insert the ball end of the string into the string hole, and replace the bridge pin by pushing it down fully. A gentle pull in the string will seat the ball under the pin. Stretch the string along the fretboard, insert the plain end into the string post hole, and pull it taut. Wrap the loose end of the string around the post until it meets where the other side of the string string enters the hole. Thread the loose end under the other side of the string, and loop it around the top. Pulling the string at a 180-degree angle will lock it into place. Tune the string to pitch by turning the tuning key counter-clockwise. You can use a guitar tuning aid, such as a tuner, pitch pipe or tuning fork, to assist in reaching the correct pitch. Trim the excess loose end with wire cutters, and repeat Steps 2 through 8 for the remaining strings. Strings need to relax before they will hold tuning pitch. 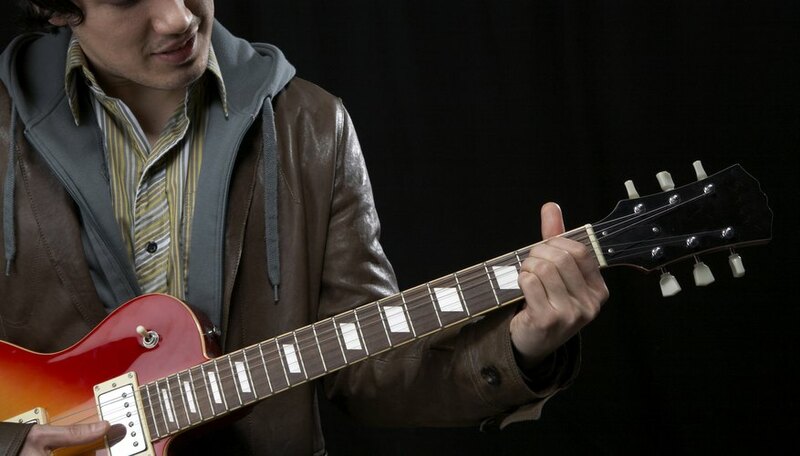 Some players let the guitar sit for several hours, but it is common practice to stretch the strings several times while tuning until they stabilize. Stretching involves tuning, applying slight upward tension on the string by pulling with one hand, retuning and repeating. You might notice as you observe others that there are several ways to secure the string to the string post. The objective is for the string to grip the post under tension, without slipping through. As long as that objective is met, it's fine. Replace strings one at a time to avoid uneven tension on the neck. Uneven tension can cause the neck to go out of alignment, requiring a neck adjustment. If all strings must be removed to access parts the guitar, replace them as soon as possible. Always use caution. Cutting tensioned strings with wire cutters could cause them to snap back wildly, and that could cause serious eye injury or facial cuts.